Madame Tussauds in Hollywood adds a figure of Patrick Swayze in a famous scene from "Dirty Dancing"
Patrick Swayze and one of his most famous scenes are now immortalized in wax at Madame Tussauds in Hollywood two years after the actor-dancer died at age 57. Swayze died after a long battle with pancreatic cancer. His widow, Lisa Swayze, and fans were at the museum for the figure's unveiling. Swayze was able to view photos of every step in the wax figure process. "It became clear to me that someone had put a lot of love into this, for a man I loved so very much," she said at Tuesday's unveiling. 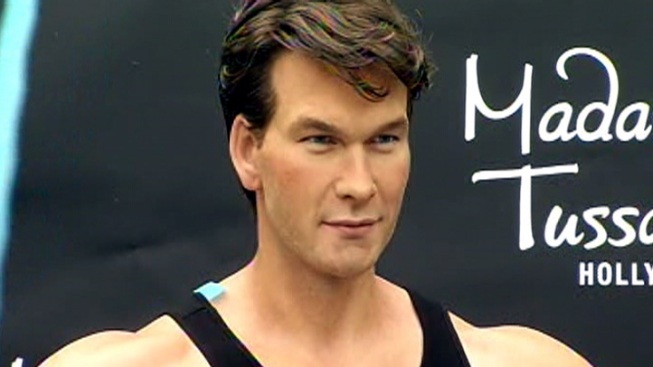 Swayze's wax figure depicts a famous scene from the 1987 blockbuster movie "Dirty Dancing." His character, "Johnny Castle," is balancing on a log in a lake -- his way of teaching "Baby, actress Jennifer Grey, how to dance. Lisa Swayze said it's an appropriate pose. "(He is saying) come and be fearless with me," Swayze said. "Go out there on a limb. Just trust. Don't look down. Take a chance in whatever you do." And, she loves the look in the figure's eyes. "They have Patrick's confident, but mischievous look," she said. It's not the first wax figure of the famous actor. Another figure was made for the movie "Ghost". "It really freaked him out when he saw it," Swayze said.